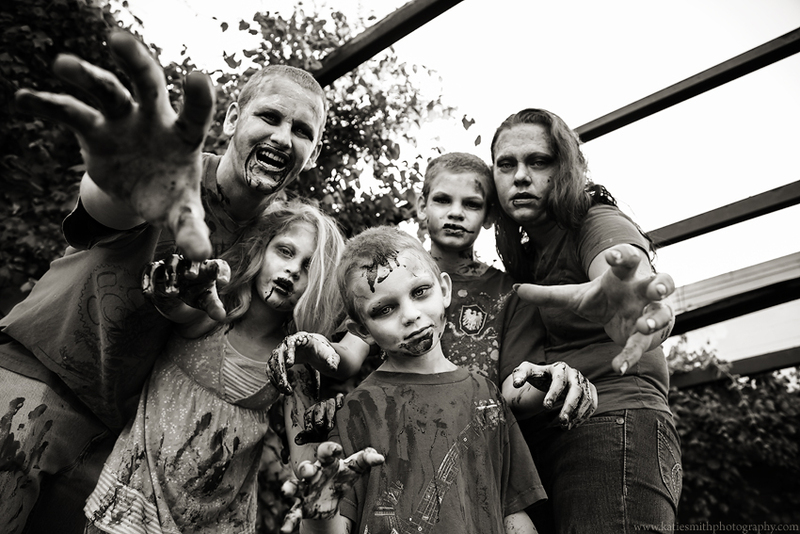 A fun family willing to get dirty and crazy… CHECK! 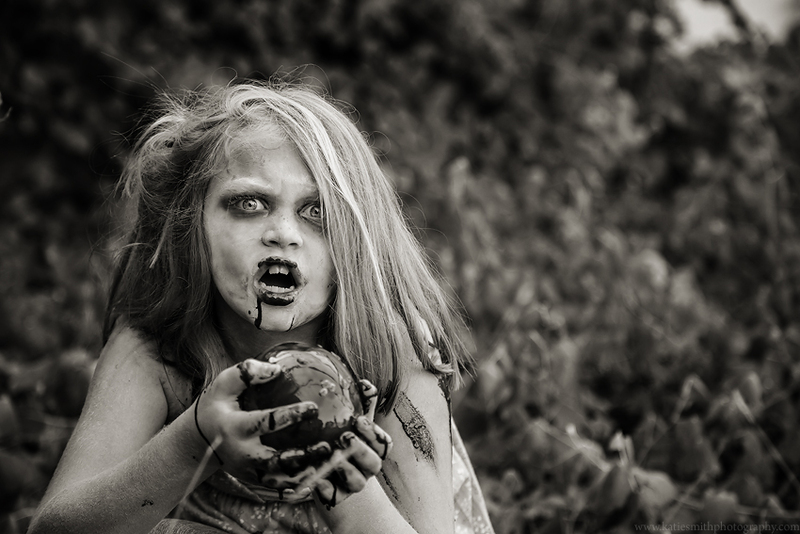 Make up and plenty of Youtube tutorials about zombie makeup… CHECK! A way to get clean after the session… oops! I knew I forgot something. I’m really excited to be sharing this session on my blog. 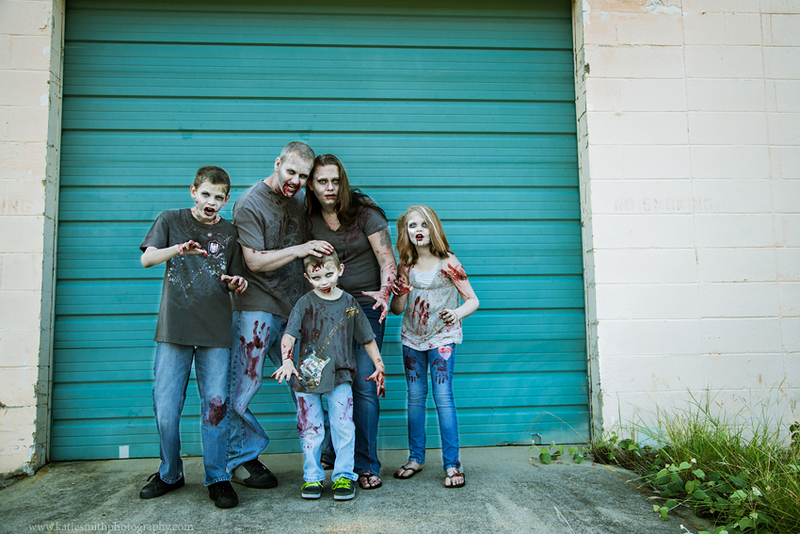 It’s not often that I get to go completely against the grain of my portrait work for something so wicked crazy and awesome like this zombie family portrait session. While I’ve been cooking up ideas for zombie sessions for a few months, this was all their brilliant idea. 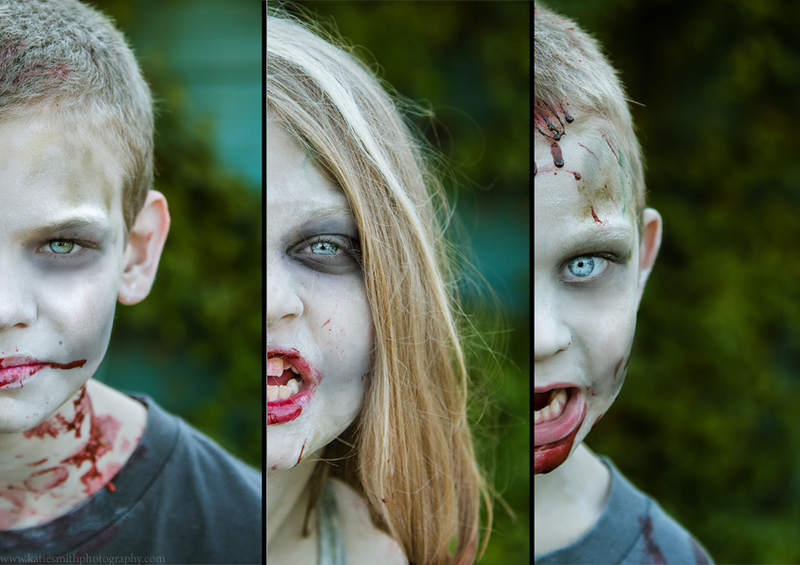 Dad is really into zombies and Mom contacted me to make this crazy idea a reality. 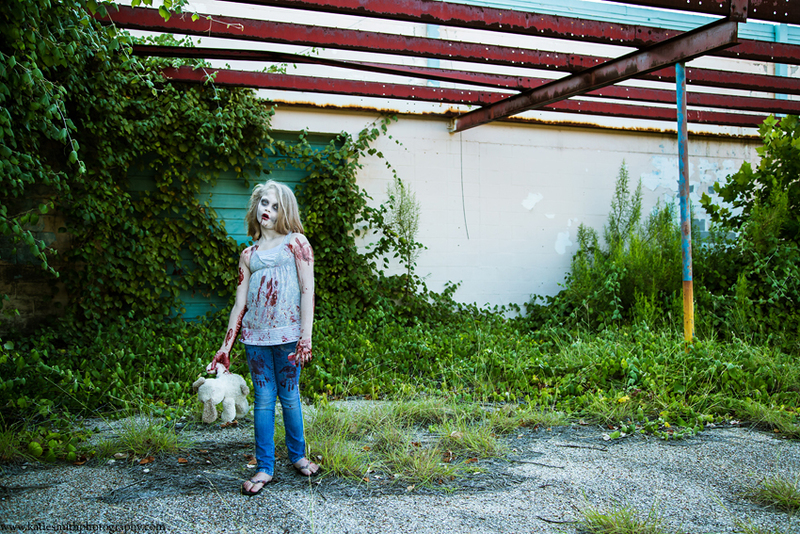 She pretty much told me they wanted to be zombies and let me have the reigns to create this unique session. The hardest part was finding the perfect location but this abandoned building was the perfect backdrop for the beginning of the zombie apocalypse. The easiest part was making the fake blood: chocolate syrup, corn syrup, and food coloring. It’s seriously that easy, kid-safe and it washed out of our clothes- though I don’t suggest testing that with your Sunday best. Once everyone was zombie-fied, we had a great time as we tried not to laugh and did our best angry, crazy-eyed brain-hungry zombie faces. I was amazed at Sister’s creepy zombie skills. I definitely got the heebie-jeebies, especially when she had the heart… a red balloon cover in fake blood. 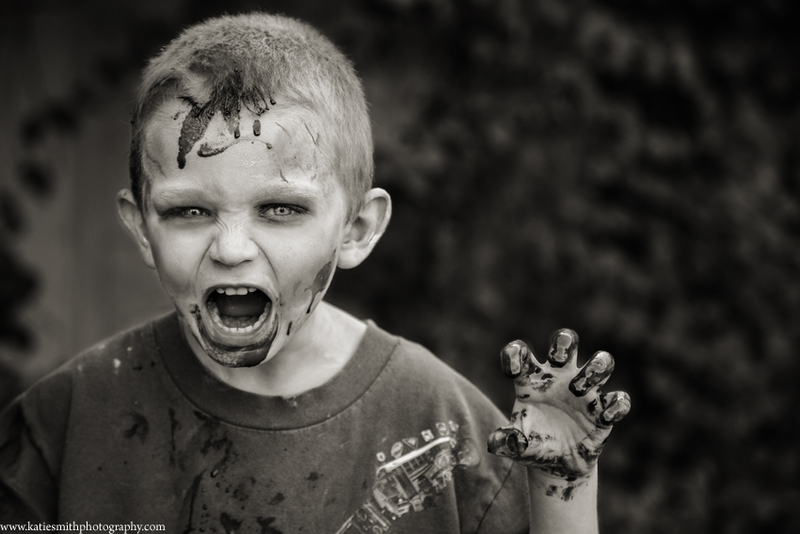 Oldest brother can do this zombie shuffle and the sound of his feet dragging against the pavement made my skin crawl. 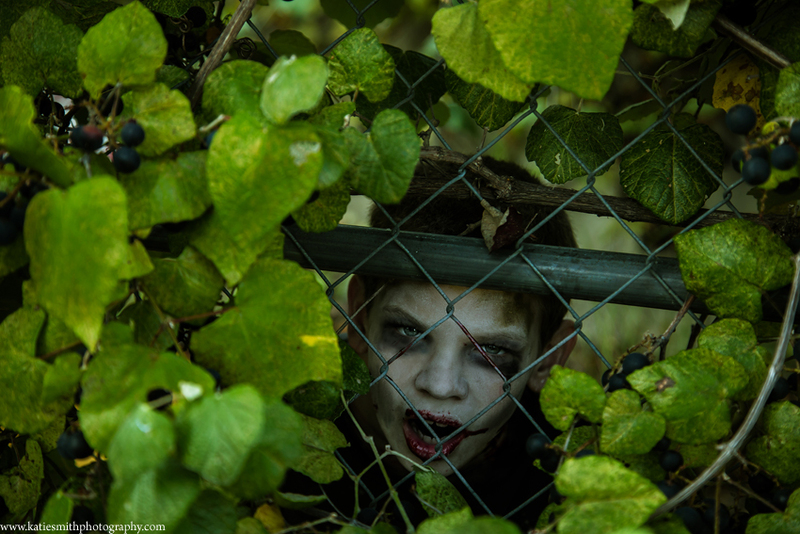 Then there was the youngest brother… and well, he’s the cutest zombie I’ve ever seen. I’d almost let him bite me just because he’s so cute. Thanks M Family for being so amazing and letting me have such a great time with your session. 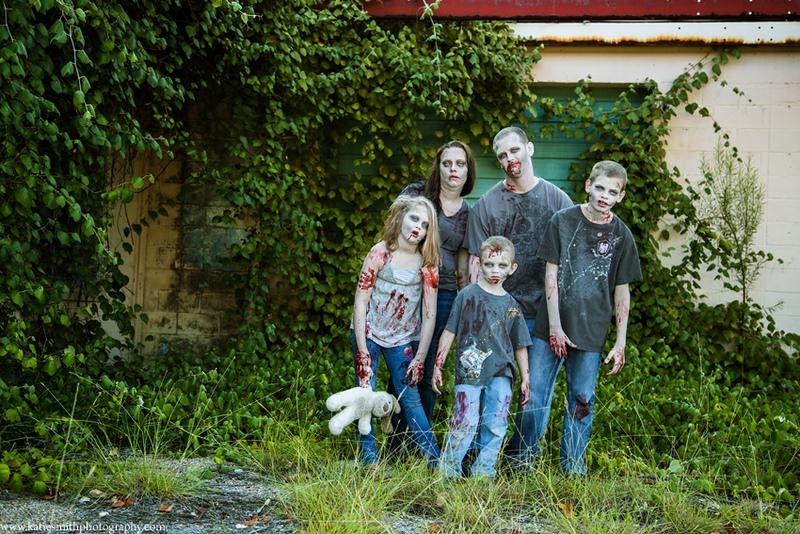 I only wish I could hear what your houseguests will say when they see your zombie family portrait on the wall. Katie Smith is a family and couples photographer in Pittsboro, NC. She loves creating themed sessions that will be fun and memorable for a lifetime. Her favorite zombie movies and TV shows include the Walking Dead and Dawn of the Dead. Find Katie Smith Photography on Facebook for all the latest news and special. Have a fun idea for a session? Email Katie to book your once in a lifetime session. I think this zombie makeup makes eyes really pop! Love this photo shoot!!! OMG – these are fantastic! So much more fun than a traditional photo shoot. Very creative. This is absolutely fabulous!!! Great job by all!